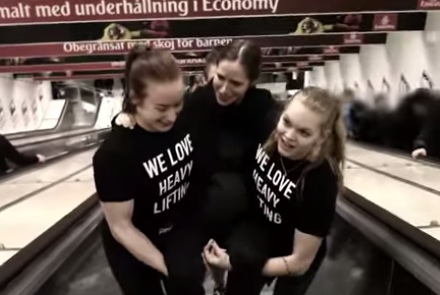 It's a collaboration between the brand's Swedish agency and a nearby CrossFit. Yesterday, our parent publication Adweek reported that Reebok is on its way to becoming “a challenger brand to contend with” after years spent falling far behind market leader Nike; at one point, Reebok made a near-majority of its sales through mail order catalogs. “Last week, Stockholm’s subway system underwent an escalator meltdown. In total, 39 escalators were shut down, and in some cases, people were forced to climb up to 180 steps. In a collaboration between Reebok and Fit4Life CrossFit, we decided to help commuters up the steep stairs. The stunt or “experiential marketing” work may not qualify as CSR, and it probably won’t lead to a sales bump. But it did prove that the now-classic joke about a vegan, an atheist, and a CrossFitter entering a bar is completely realistic…except for the fact that those three would definitely NOT go to the same bar.